Who are the "Organizations" of CORE? 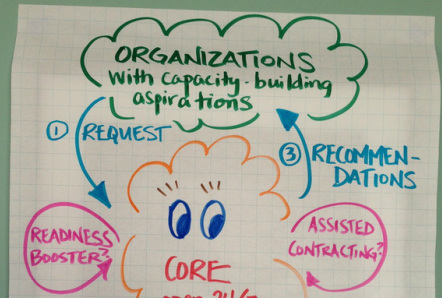 CORE is itself a collaboration of existing organizations, consultants, and funders. When we talk about serving organizations, we mean any group of persons functioning together to effect some form of social change, social, economic or environmental justice, advocacy or community building. For our current round, to apply to be matched with a consultant for a project to build capacity, organizations must also be headquartered in Dane County, Wisconsin, or in one of the eight surrounding counties (Columbia, Dodge, Green, Iowa, Jefferson, Lafayette, Rock, Sauk). Are you a leader of an organization seeking an outside consultant, trainer, or coach to help with a capacity-building project? Congratulations! Whether you are seeking deep transformation or just a little support to take your work to the next level, it can be a big step to ask for help!